Proper nutrition is essential to your kitten's health. Introducing a kitten into your home can be a life-changing experience. Kittens need constant care to thrive and grow into healthy adult cats, and proper feeding is essential for food health. As a responsible owner, it is your duty to make sure your kitten is fed nutritious food. 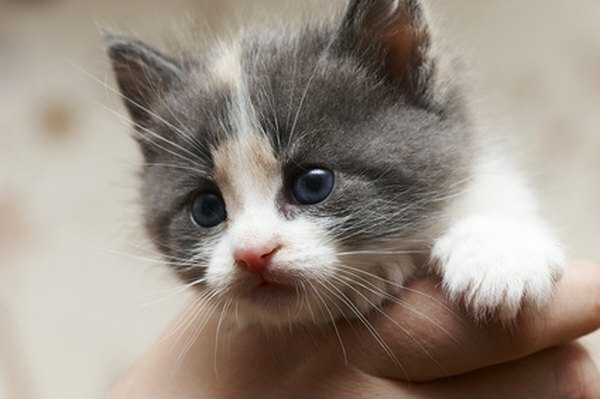 Decide whether your kitten will eat canned food or dry food. Canned food is easier for many kittens to eat, but it does not provide the teeth-cleaning capabilities of dry food. Pick a cat food that is specially formulated for kittens, and is free of fillers such as corn and ash. Set a feeding schedule for your kitten. Kittens typically begin trying solid food at three to four weeks old, and will be fully weaned from their mother's milk by eight weeks. Some owners choose to free-feed their animals, allowing the kitten to eat on and off throughout the day. Others feed their kittens at the same time every day. Decide how much to feed your kitten according to the instructions on the label of your chosen cat food, since different foods require different portion sizes to provide adequate nutrition. Feed him at least three small meals a day until he is six months old, and then reduce feedings to twice a day. If you plan on free-feeding, dry food works best since it will not spoil like canned food. Provide your kitten with fresh water at all times. Kittens are very susceptible to dehydration, and free access to water will keep your kitten well hydrated. Limit your kitten’s access to treats and leftovers. As tempting as it may be to feed a crying kitten food from your plate, too much human food can make your kitten very sick. If he is insistent on a treat, give him one specifically designed for cats. Feed your kitten away from other animals. Older, more dominant animals may chase the kitten off and prevent her from eating. Kittens younger than four weeks don't need any food but their mother's milk. If for some reason their mother can't feed them, you will need to provide a milk replacer specifically formulated for kittens. Your vet can advise you. How Old for Your Kitten to Be Neutered? How Old Is a Kitten When It Goes Into Heat?